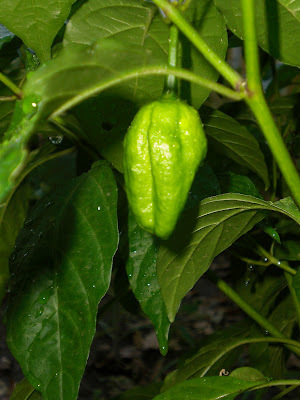 This habanero plant is year 2 for this plant! We got this plant last year as a gift and kept it on a table near our window. The first year it had a handful of peppers. It survived all winter, but it looked pretty sad because it lost most of it's leaves. When spring came along we decided to plant it in the garden. To our amazement, it thrived! It grew so large, and we have habanero peppers growing again! These are really spicy, I have to be careful when I cook with these! I use them mostly in Jamaican beef patties, and in my first batch of pickles! I can't wait til these turn bright red! When the turn color, they become even hotter! Yum! Awesome. I love growing pepper and mine are finally coming in. BTW, we couldn't wait the 10 days before we opened the jar of pickles. I made some with and without the peppers. I highly recommend the peppers as they add so much to the recipe. Thinking about canning my cauliflower the same way. I keep hearing that people bring their peppers indoors in the winter but I have never tried it! Maybe this year I will. My Mom could eat hot peppers. I mean HOT! Me I can't take very much heat. A little is good. I heard that peppers could go a second year, but never saw it done. I might have to dig mine up and bring them in at the end of summer.